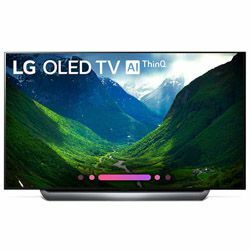 Talking about LG OLED65C8PUA vs Sony XBR65A8F, LG TV gives you AI ThinQ technologies and becomes the hub for the smart home included intelligent voice control and LG Magic Remote to pull up family photos, control light settings, check the weather and more. Also, you get the perfect black and intense color made possible by LG OLED display technology. Sony TV combines processing power with beautiful OLED picture and a sleek design to bring in a new standard of home entertainment. LG OLED65C8PUA belongs to the newest C8 2018 series. So you get access to the latest LG technologies for a good price. Sony XBR65A8F also presents the A8F 2018 series for the better entertainment experience. 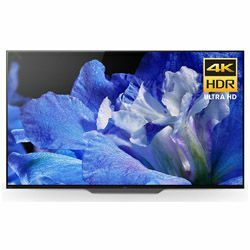 If we compare Sony XBR65A8F vs LG OLED65C8PUA in technologies capability, Sony versus LG gives you more smooth and vibrant colors with TRILUMINOS Display & 4K HDR Super Bit Mapping. Pictures and sound in perfect harmony with Sony’s Acoustic Surface. But the second gives you Dolby Atmos technology which transports you with moving audio. LG and Sony TVs play a very high-quality 4K Ultra HD picture, including HDR10. Each of the 8.3 million individually lit pixels of the LG OLED TV with AI ThinQ can brighten, dim or power off completely in LG. But the Sony’s OLED panel’s native 120Hz refresh rate is enhanced by Motionflow XR gives you the fast-moving action scenes with no motion blur. Sony delighted me with X1 Extreme processor upconverts your content to near-4K HDR quality, bringing stunning contrast and absolute blacks to your favorite shows and movies. LG presents α9 Intelligent Processor makes the most of the self-illuminating pixels, providing true-to-life images with rich colors, superior sharpness, and enhanced depth. Both TVs are pleased with the build quality and design. Both look almost frameless and resemble TVs with augmented reality, where the lights go beyond the edges of the metal frames. The newest α9 intelligent processor - you can forget about any lags. Dolby Atmos audio technology developed for state-of-the-art cinemas. AI ThinQ enhance picture technology. The WebOS app store is pretty bad, there are many apps that they don't have. TRILUMINOS Display & 4K HDR Super Bit Mapping technologies which enhance the picture. Powerful X1 Extreme processor works very fast. Dim picture - yeah, a bit brighter would've been better. There is a high chance of getting a defective TV.